Mega Mass and D-Whey capsules are the most popular ayurvedic mass gainer pills that help to increase weight and bone density to provide stronger and healthier body. Major part of bodyweight is of fat, muscles and bones, out of these weight of muscles and bones is considered as good but fat beyond a certain limit is bad for health D-Whey capsules and Mega Mass capsules in combination are wonderful herbal mass gainer pills which increase muscle mass and bone density to provide stronger and fitter body. D-Whey capsules possess herbs which cleanse digestive system and promote protein synthesis, protein is building block for muscles and its optimum availability provide faster growth in muscle mass. Some of the herbs used in these mass gainer pills possess anti-toxin properties to eliminate toxins and other damaging compounds in blood. These herbal weight gainer pills regulate bowel movements and ensure complete defecation of waste matter and also promote healthy hormonal balance. These herbal mass gainer pills enhance urinary system and promote faster rate of tissue generation. These herbal weight gainer pills also possess herbs which maintain flow of energy to keep muscles strong and enduring. 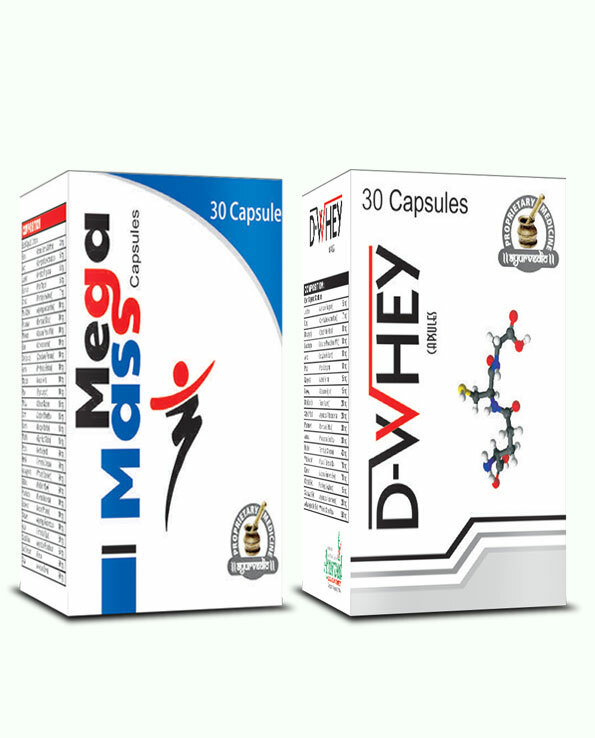 Mega Mass capsules are recommended with D-Whey as ayurvedic pills to increase weight fast. These herbal mass gainer pills possess herbs which supplement wide range of nutrients and fulfil nutritional requirements of the body. 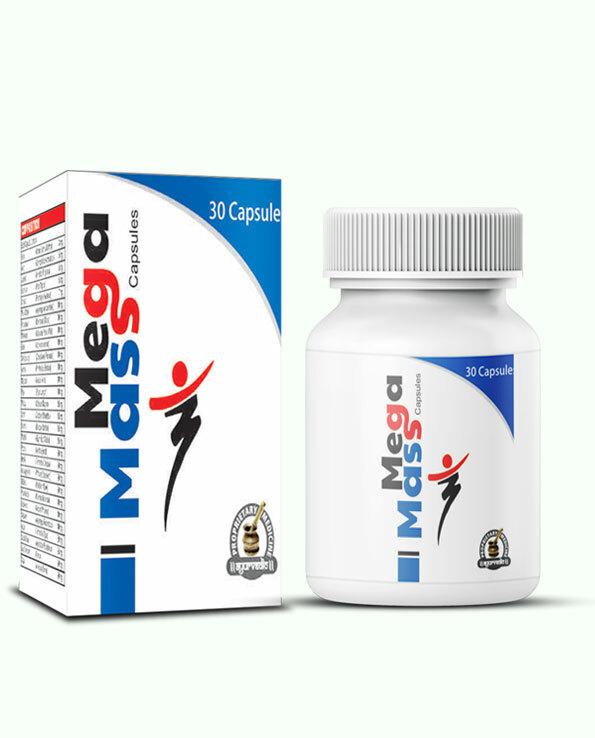 Mega Mass capsules work as herbal mass gainer pills by promoting higher production of energy and providing optimum support to all the systems of the body. These herbal mass gainer pills supplement calcium and vitamin D and generate bone tissues to increase bone density. Mega Mass capsules improve digestive system and promote hormonal balance, these herbal mass gainer pills also possess herbs which provide improved mental health and alertness and sharper memory and focus. Mega Mass capsules supplement active antioxidants and suppress activities of free-radicals to slow down process of ageing. These herbal mass gainer pills open blocked blood vessels to ensure optimum supply of nutrition and also metabolize fat faster to produce lean muscle mass. Mega Mass capsules increase RBCs in blood and cure anemia, promote healthy hormonal secretion and possess aphrodisiac herbs to rejuvenate reproductive system. D-Whey and Mega Mass capsules increase healthy weight, enhance stamina, and improve functions of cardio, circulatory, digestive and excretory system to provide long-lasting results. These herbal mass gainer pills are excellent for those males who want to get muscular and stronger body. These ayurvedic pills to increase weight fast provide shapely and curvy body to females by increasing healthy bulk. Mega Mass capsules and D-Whey capsules are herbal mass gainer pills which possess only herbs. Herbs are well known for providing safe results since ancient times. These weight gainer pills work for men and women equally well and also for those who want to gain muscular body. These enhance healthy weight by improving body’s mechanism to provide long-lasting results. Mega Mass capsules possess wide range of herbal ingredients which are – Kesar, Long, Jaiphal, Kali Mirch, Chitrak, Safed Musli, Punarnava, Malkangni, Kasni, Shankhpushpi, Amla, Nagkesar, Pipal, Sonth, Brahmi, Mulethi, Podina, Haritaki, Ashwagandha, Gokhru, Vidarikand, Kapikachhu, Shatavari, Arjun, Shilajit, Lauh Bhasam and Sowa. 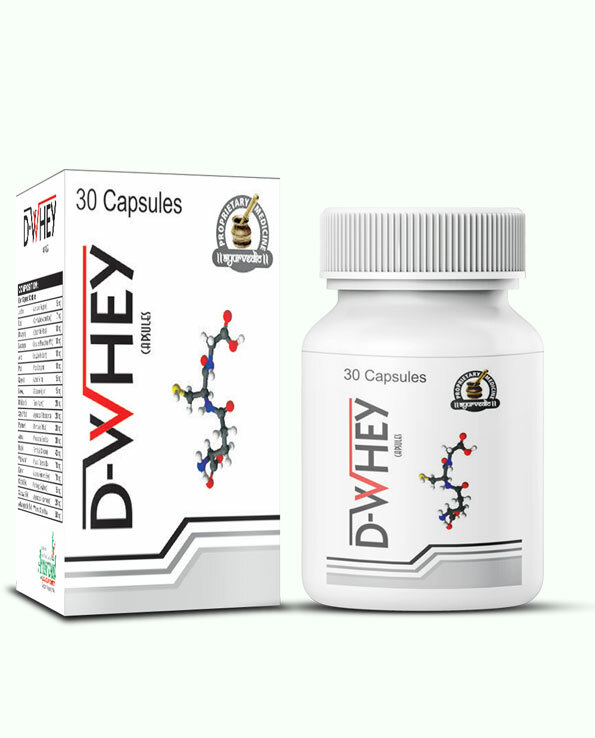 D-Whey capsules also possess perfect combination of highly beneficial herbs, these pills possess ingredients which go as – Jaiphal, Long, Bhringraj, Malkangni, Arloo, Pipal, Nagkesar, Makoi, Brahikandh, Safed Musli, Punarnava, Amla, Haritaki, Vidarikand, Kaunch, Chitrak Ext., Shatavari Ext. and Ashwagandha Ext. These supplements have been designed so that people can use these easily. All one need to do is consume one or two pills of these twice in a day after meals with water. Support these supplements with nutritious diet and healthy lifestyle and maintain regularity. If you are skinny since young age these may take about 6 months to show their complete effects but for those who are suffering with poor weight and vitality due to diet, lifestyle or any disorder these provide complete relief within 4 months of use. Eat foods high on fibre and protein, also include fat-free dairy products to gain calcium and other minerals and include foods which provide complex carb. Take a six course meal everyday with breakfast lunch and dinner, and snack twice in a day. Include seeds and nuts in snacks to complete the nutrition. We offer range of options for you to make payment conveniently. You can pay us on delivery in India and can also send us cheque or DD. We also accept payment through NEFT and you can also deposit cash in our account directly. Your privacy is maintained right from order till delivery; you will receive products right at your doorstep in packing concealing details of the products completely. We deliver within 3 to 5 days anywhere in India and use FedEx to ensure timely delivery. 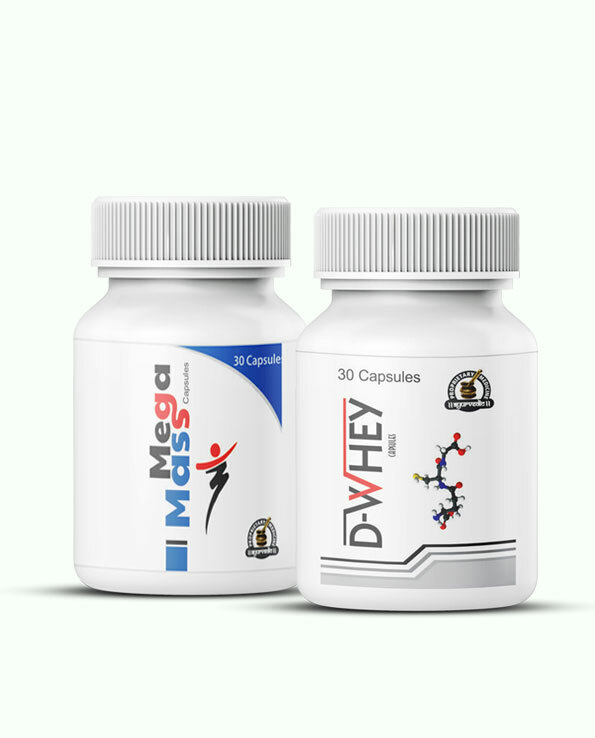 The combo pack of Mega Mass and D-Whey was very helpful for my father who is 55 years old and is facing the problem of low energy since 1 year. He takes these supplements daily and there is a great improvement in his energy. I was able to gain 5 kg within just 2 months of intake of Mega Mass and D-Whey capsules. Amazing Combo!! I purchased Mega Mass and D-Whey for my brother. Now there is significant change in his stamina level. Truly thankful to the manufacturers of these products who have brought such a wonderful combination to the online market!! My mother was having the problem of underweight then she tried this great combination. It was really helpful in increasing weight. Hats off to the makers of these pills!! Both of these are amazing products in terms of improving muscle mass. I am happy that these are really working. All thanks to Mega Mass and D-Whey. Which food should I Avoid while using these pills? Avoid eating unhealthy foods like junk foods, oily, spicy foods and also strictly say no to processed and pack foods. Avoid drinking carbonated drinks. I am active in sports and needed something that gives me extra mileage. I was never interested in drinks and shakes that simply supplement minerals or other energy providing elements. I wanted my system to improve and become more efficient for long-lasting results. Mega Mass and D-Whey capsules were perfect fit in my bracket of choice. These in couple of months have provided stunning benefits and I feel lot energetic and strong. The extra push that my muscles and joints provide has brightened my performances. Wonderful!